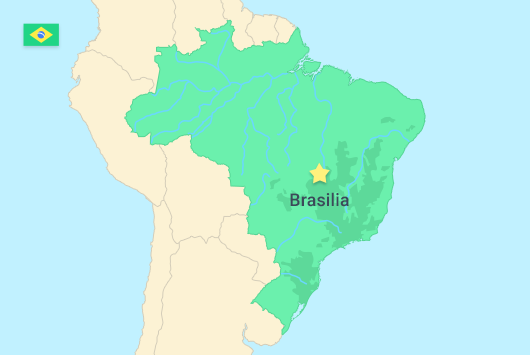 Brazil is the largest and most influential country in South America with a population of 210 million citizens and an area of 3.3 million square miles. A home to diverse wildlife and breathtaking nature, Brazil is widely known for the Amazon Rainforest as 60% of the forest is located there. The South American nation is famous for its lively inhabitants, exotic food, energetic music, and stunning beaches. Being the most developed economy on the continent, Brazil is also the 9th largest worldwide. Iron ore, coffee, tobacco, cocoa, soybeans, raw cane, oilseed, mineral fuels, beef, and poultry are among its top exports. While its development has slowed due to the recession since 2008, it is still projected to become the 8th largest economy in the world by 2030. Brazil aims to invest heavily in infrastructure and deforestation of the Amazon Rainforest. Even in the challenging economic conditions, the Brazilian tech innovation sector has been booming in recent years. According to the World Bank, 86% of the 210-million population of Brazil lives in urban areas. The most densely populated metropolitan regions include Sao Paulo with 21 million inhabitants, Rio de Janeiro with 12 million, and Belo Horizonte with almost 6 million. With the growing urbanization, many well-educated Brazilians consider freelancing as an additional or even main source of income. Top freelancers offer their services in software development, graphic design, and customer support. The official language in Brazil is Portuguese, but young people study English as a first foreign language in school from an early age. The literacy rate in the country is 92.6%. Brazil is home to a number of prestigious universities worldwide. Universidade de Sao Paulo is rated as #1 in South America, while Universidade Estadual de Campinas comes second on the continent. Some of the most popular university programs include medicine, dentistry, engineering, design, and business management. Because of the high unemployment and low payment rates, many well-educated Brazilians use freelancing as a way to reach the world market. They offer solid skills and top experience in sectors like customer and technical support, graphic design, and software development. Rated as the world’s seventh largest technology market, Brazil is steadily tuning its education and professional service to meet the outsourcing demand in technology worldwide. The current average income in Brazil has increased to 2032 BRL ($640) per month in 2016 according to Trading Economics. It is expected to increase to 2500 BRL ($788) until 2020. Depending on their location, freelancers are likely to charge different rates because of the varying costs of living. Rural areas have lower average income and expense levels while metropolitan cities like Sao Paulo and Rio de Janeiro have much higher rates. The average income of a Customer Service Representative in the Sao Paulo area is in the range of $1,500 per month. In the Hortolandia municipality, which is also in the state of Sao Paulo, the average salary for the same position is around $1,000. The currency in Brazil is the Brazilian Real. The current exchange rate is 1 USD to 3.17 BRL. Electronic payment services like PayPal, Payoneer, and Transferwise operate in Brazil.